Always use the right tools to handle your fresh baked waffles. Heat-resistant silicone tools keep non-stick surfaces in immaculate condition, which allows waffles to easily slip off the iron. Choose butter and cooking oils over artificial cooking sprays. Butter and oil are easier to clean and will help season your waffle iron’s surface. Cooking sprays often contain chemicals that leave behind residue. A little elbow grease and soft sponge is all you need to keep your waffle iron like new. 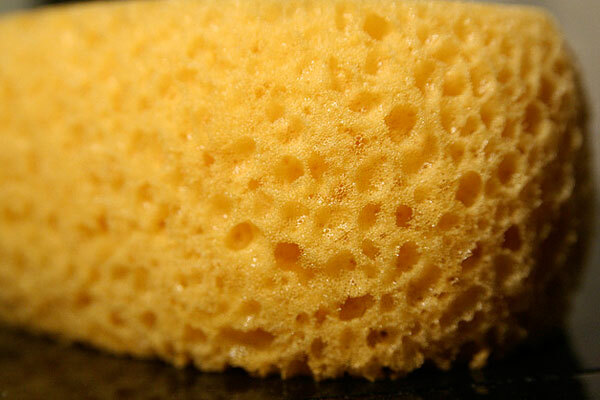 To clean your waffle iron, use a soapy, non-abrasive sponge, toothbrush or cloth to remove the grit. You may even have the option to pop the plates off your waffle iron and place them in the dishwasher. Fight the temptation to let the plates sit with sugar, butter and waffle bits for too long. The waffle iron is infinitely easier to clean before the bits have had a chance to harden. If you find that the bits have hardened (we understand, few can resist the lure of fresh baked waffles), we recommend the steam method to clean. Simply spray water onto the affected areas and turn the waffle iron back on. The steam will help loosen the debris off the plates. Just be sure to unplug and let your iron cool off slightly before handling and cleaning. Dry the waffle plates thoroughly before tucking your iron away. Optional: lightly coat your waffle iron with a bit of oil or butter to keep your waffle iron seasoned. This is strongly recommended for cast iron waffle makers. Maintaining your waffle iron will give you beautiful waffles for years to come! How do you keep your waffle iron like new? Share your tip in a comment! I have a commercial waffle maker with cast iron surface and with this method you prefer to clean a non-stick waffle makers, or even a professional waffle makers to? and if not, how you should clean a commercial waffle maker? Hello Luka. Our cleaning tips work effectively on all waffle irons, including professional-grade and cast iron waffle makers. In the case of caring for your cast iron waffle maker, here are a few extra tips. Soap isn’t necessary as it may remove some of your hard-earned seasoning. Our recommended steam method will clean most stuck-on food debris. If you have stubborn bits, you can use a scrubber or scraper on the cast iron as its surface is very durable. Most importantly, be sure to dry every nook thoroughly right after cleaning to prevent rust. Always add a light coating of oil or butter to the waffle plates before storing and your cast iron waffle maker will continue to make perfect waffles for you. Hope this helps and don’t hesitate to let us know if you have additional questions! Thanks a lot for this detailed information. Now everything is much clearer to me. As i understood, after cleaning your waffle maker you have to add a light coating of oil or butter to the waffle plates before storing, i thought it was only essential just before baking the waffle. Yes, i have some additional questions and thank you for giving me a hand. 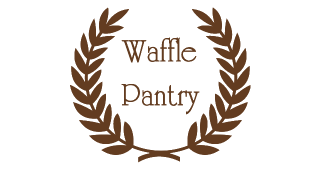 Is it effective to use the same cast iron waffle maker alternately for a Brussels waffle and for a Liege waffle , or Liege waffle’s caramelized Pearl sugar will obstruct it? And one more question, usually waffle should be eaten fresh, or it would be also possible to leave it out for 30 + minutes at room temperature and than toasting it in a waffle maker for several seconds to make it again warm? So glad to hear our tips are helping, Luka! You can add a coating of oil/butter to the waffle plates both before the baking process and before storing. The reason we recommend before storing is to keep the cast iron well seasoned. This helps maintain the non-stick quality of the cast iron while it is stored. 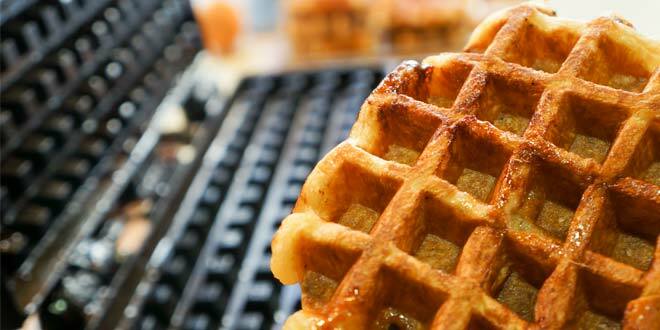 In terms of using the same waffle iron for Brussels and Liege style waffles, cooking one or the other or both will not have any effect on the waffle maker. The main thing to keep in mind is keeping the waffle maker clean between uses. Also, it is ok to eat waffles off the iron or at a later time. If you find you have more than you can eat, you can either save and reheat for same day snacking or you can freeze them for a later time. You can reheat on the waffle iron, in a toaster or even in your oven. The next time I have stuck on batter in my non-stick Belgian waffle maker I’m considering using my handheld steam cleaner to blast away the mess. Do you think this would be OK? Spraying a bit of water onto your waffle iron and allowing the iron to heat up will usually do the trick and loosen up the mess. Your handheld steamer idea sounds interesting but we recommend checking the manuals for both your waffle iron and handheld steam cleaner to see if this use would be appropriate. I use Krampouz WECDHAAS 4″ x 7″ Liege-Style Waffle Maker at our restaurant. We cannot continuously turn the waffle maker off to clean with steam method. Yet we need to clean the melted pearl sugar from the waffle maker (while it is still hot) before it burns and forms a sticky solid black hardened layer. Leaving this layer on the waffle maker, reduces the caramlisation on subsequent leige waffles which leads to even a bigger mess. Is there a way to clean the plates of excess sugar on the fly. Thanks! It sounds like your waffle iron gets heavy usage on a day-to-day basis and the best thing to do would be to spot clean with a wet sponge as soon as buildup begins to appear. The sponge will help wipe away the larger bits and the excess water from the sponge will generate steam to help loosen the more stubborn debris. You can then wipe away with a cloth or clean, dry sponge. If you find that this method is not effective enough, you may want to invest in a set of tools such as the Krampouz Waffle Tool Kit. It’s designed by the same manufacturer as your waffle iron and will be able to get into those hard-to-reach nooks. As always, do exercise caution when working with and cleaning a hot waffle iron! We hope this helps! How should you clean the iron between waffles? We have a commercial Liege waffle iron and it is giving us hell! It is very difficult to clean between waffles due to the pearl sugar. Mix three cups of water and one cup of potato starch, pour it into your waffle iron (iron can still be hot), and let it sit for 4 to 5 minutes. The liquid solution should turn into a jelly type of a texture, which you can peel out in one piece from your iron.This method works like magic and scrapes all residues from your iron. Feel free to decrease the content of water or alternatively increase the potato starch content in case you have difficulties in removing the jelly type texture in one piece. We especially recommend this method to our food service customers who make Liege waffles in a commercial setting and high volumes. Let us know if you have any further questions! Do you have suggestions on how to clean the waffle iron during service? We use it in a restaurant where Liege waffles are our focus. We are having trouble making sure the sugar doesn’t burn onto the iron. We haven’t tried the potato starch trick. Does that work better than making a flour based throwaway batter? Any other suggestions for quick cleaning during a rush? In a commercial setting, we strongly suggest the previously mentioned water and potato starch mixture cleaning method. You can alternatively use one cup of water and a couple tablespoons of corn starch. Just pour the mixture into your waffle iron and let it rest for 4 to 5 minutes (while waffle iron remains hot). You should be able to easily peel off the dried mixture with all the sugar residue in once piece once the mixture has cooled. As a preventive measure you could also use a cast iron brush or a moist towel to scrub the iron in between batches, just make sure the brush is safe to use with your iron. I hope this helps! This is Chetan from India and I bake Brussels and Liege Waffle in a commercial Cast Iron. I make around 100 waffles daily and use Luxinos Waffle Iron and also Krampouz machine. After a day use itself my waffles plates go really black and loads of residue left inside. I clean using a wire brush at the end of the day but by that time loads of black carbon is formed. It is difficult to clean the plates between the waffles as we have Continous orders. What’s the best way again to clean? So the cornstarch and water method everytime works best? I can pour it in the hot Waffle Iron you are saying? Will the sponge and water also help in residue not sticking to the waffles? Also my Brussels waffle sometimes sticks to the machine. What’s the right way to season the Iron and the right temperature to cook the Waffle. Is it necessary to apply oil before pouring batter for every waffle? Plus when I am not cooking the waffles what temperature should the machine be standing on. In a commercial setting, we strongly recommend the previously mentioned starch and water solution to clean the iron. The solution can be safely poured into the iron while it’s hot. A moist sponge is also a great tool to prevent residue from building up. We suggest using cooking oils or butter to season your iron, this should help keep waffles from sticking to your iron. Hi Lisa, Thanks for the reply. Do I need to apply Oil after every Waffle? Also at what temperature do I cook the Waffles? I see it sticking if the machine is over heated too. Every waffle iron is different so we recommend adjusting as needed. Depending on how well your plates are seasoned, you may or may not have to add oil. If you find your waffles are sticking when they’re done, apply oil as needed. You’ll want to approach the temperature in the same fashion, finding the sweet spot and using that setting to make your waffles. 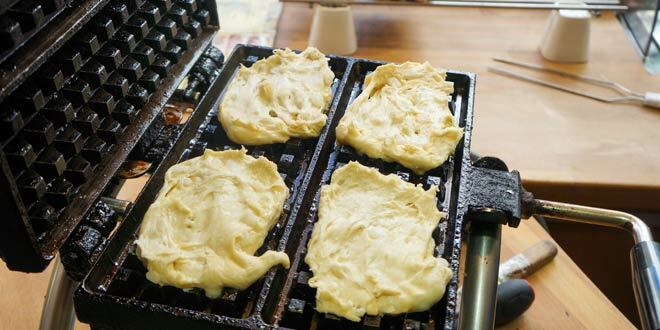 Do note that after each waffle bakes, the iron will cool just a touch so you should allow the iron to fully heat back up before adding dough for the next waffle. Thanks for pointing out that spraying water on the waffle iron will help to clean it because the steam will help loosen the hardened debris. My husband and I love to make waffles for breakfast and are thinking about buying some waffle dough in bulk soon. I do sometimes have trouble cleaning our waffle iron, so the tips you shared will really come in handy!